Could NUSofting's free Sinnah synth be your sonic saviour? It'd be a sin to miss out on a free synth. 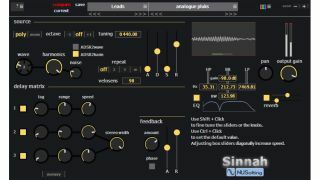 NUSofting has released a new free virtual analogue plugin synth known as Sinnah. This is powered by a single oscillator that offers five waveshapes. The other headline feature is the delay matrix, which can operate in a variety of configurations, and there's also an analogue-modelled ADSR envelope and a stereo filter. Other features include a simple reverb, an oscilloscope and peak meters. NUSofting says that Sinnah's sounds are hard to describe in words, but that it can produce a 'wide and wild' range of different timbres. You can find out more and download Sinnah on the NUSofting website. It runs on PC and Mac as a 32/64-bit VST/AU plugin.